Gujarat is all set to “beat” all Indian states in privatization of basic healthcare services, if the latest data, released by the Government of India, are any indication. 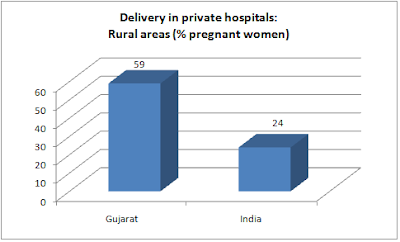 Based on primary survey, the National Sample Survey Organization (NSSO) data show that just about 24 per cent in Gujarat’s rural areas and 15 per cent in urban areas receive non-hospitalized treatment in government hospitals, while the rest relied on private facilities. The data, in fact, go to show that, the percentage of population getting non-hospitalized treatment in government hospitals in rural Gujarat has virtually stagnated over the last two decades and drastically gone down in urban Gujarat; but the all-India trend is moving in the opposite of this. 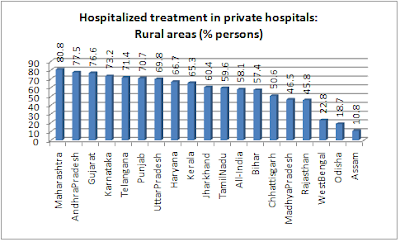 Thus, in 1996, 25 per cent of Gujarat’s rural areas got non-hospitalized treatment in government hospitals, as against 19 per cent in the country’s rural areas. The respective figure for Gujarat in 2004 was 21 per cent and for India 21 per cent; however, in 2014, it reached 24 per cent for Gujarat and 28 per cent for India. As for the urban areas, 22 per cent of Gujarat’s population received non-hospitalized treatment in private hospitals in 1996, which went down to 18 per cent in 2004 and 15 per cent in 2014. However, the respective figures for India’s urban areas are 20 per cent in 1996, 19 per cent in 2004 and 21 per cent 2014. 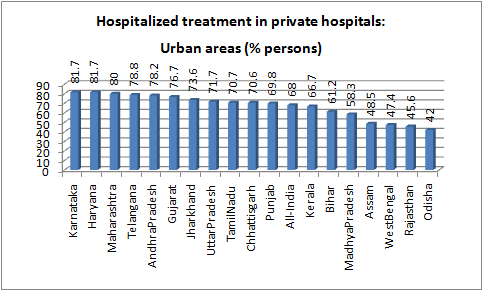 Hospitalized treatment: The data further show that 76.6 per cent in the rural areas and 76.7 per cent of the urban areas received private hospitalized treatment in Gujarat in 2014, which is one of the highest in the country. The data show that all-India average on this score is 58.1 per cent and 68 per cent respectively. The states where a higher percentage of people relied on private hospitals compared to Gujarat are Maharashtra and Andhra Pradesh in rural areas, and Karnataka, Haryana, Maharashtra, Telangana and Andhra Pradesh in urban areas. 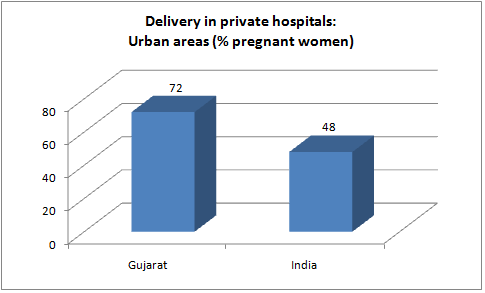 What is equally interesting is that, in the age group 15-49, in Gujarat, 59 per cent of pregnant women in rural areas and 72 per cent of them in urban areas were taken to private hospitals for delivery in 2014 – which is the highest in India. 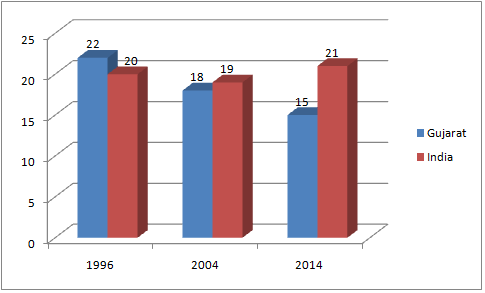 The respective percentage for India is 24 per cent and 48 per cent, respectively. “In the urban areas the percentage of hospitalized treatments received from public sector hospitals varied from 18 (Haryana and Karnataka) to 58 (Odisha). In Maharashtra, Andhra Pradesh and Telangana also higher extent of dependence on private sector hospitals is observed”, it said.